We haven’t done a totally biased product review for a while, so it’s time. Why did we wait so long, you ask? 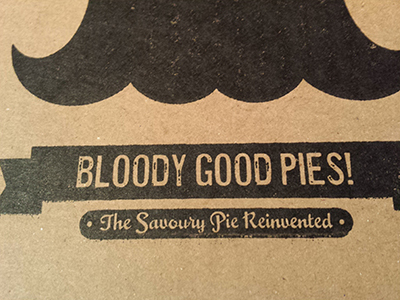 Well, unlike the bloody big deal, the Brits in Toronto crew wanted to make sure that the bloody good pies were going to be around longer than a year. Our hidden secret, the place we hoped no one would find out about, is getting noticed. The Pie Commission was recently featured in Toronto Life as one of their seven favourite pies. Can’t say we disagree. It’s a small place. Tucked away down an alley off The Queensway, east of Islington, you may drive past it the first time. But if you slow down to the statutory Ontario speed limit of 40 kilometres per hour, you’ll be able to check your rearview mirror, indicate and pull in safely. They have a patio! 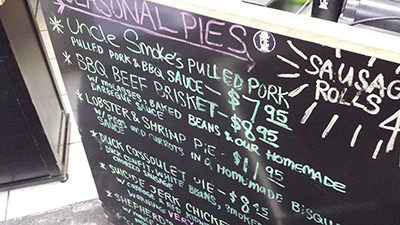 We like to refer to is as the Pie Patio (and piepatio dot com is still available, chaps, just saying …) for those who prefer to sit outside and break their crust. 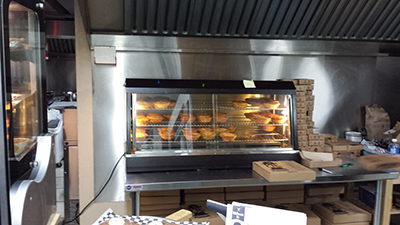 The smell of freshly-baked pies is heaven. It’s warm and cosy, there’s a couple of stools to perch on and a nice selection of hot sauces. But, let’s just get to the meat and potatoes of the review, shall we? Or, the chicken, cheddar, bacon and mash of the review. Because that is a filling. And it’s really good. There are regular specials. Pulled Pork? Lobster and Shrimp? Duck Cassoulet? Come on … really? Outstanding! … and they have all been delicious. But the best thing about their pies is the crust. It is so flaky, buttery, melt in your mouth, that The Pie Commission should sell snack bags just of crust chunks — and give Brits in Toronto 10% commission for the idea. Or free pies. We’re easy. They also sell a delicious sausage roll that is a decent size and a nice selection of smaller sweet pies too, such as coconut cream and chocolate Nutella banana custard pie. It’s always worth just dropping in as the selection seems to change often. No surprise from us. A solid Brits in Toronto 5/5 stars. This entry was posted in Uncategorized and tagged brits in toronto, the pie commission on February 9, 2015 by britsintoronto.